Note: Distillate fuel volumes with sulfur content below 15 parts per million produced before 2004 are included in the 'between 15 and 500 ppm' category. Distillate fuel supply for 2014 includes estimated volumes for December 2014 from the Short-Term Energy Outlook, February 2015. Republished February 24, 2015, 9:30 a.m. to correct an error. Distillate fuel oil supply consists primarily of diesel fuel used for transportation and of heating oil burned in furnaces and boilers. Over the past 20 years, the U.S. Environmental Protection Agency (EPA) has regulated the amount of sulfur contained in diesel fuel to enable reductions in harmful emissions of nitrogen oxides and particulate matter from diesel engines. Since 2006, most distillate fuel has had less than 15 parts per million (ppm) of sulfur, a drastic change from the early 1990s, when high-sulfur diesel had an average sulfur content of 3,000 ppm. This change has improved air quality by reducing sulfur emissions with only a minor effect on the average energy content of distillate fuel consumed in the United States. Diesel fuel supply is subdivided into the highway, nonroad, locomotive, and marine categories. Beginning in 1993, the EPA required petroleum refiners and marketers to introduce diesel with sulfur content no higher than 500 ppm (low-sulfur diesel) for highway use. In 2006, the limit for highway diesel was further tightened, as the EPA required no more than 15 ppm of sulfur (ultra-low-sulfur diesel) by 2010. EIA has updated its survey data collections several times in response to increasingly stringent limits on sulfur content, creating new distillate fuel categories to account for the new, lower-sulfur diesel fuel types. Tighter sulfur limits are also being applied to nonhighway diesel. In 2007, the EPA required nonroad, locomotive, and marine diesel (NRLM) suppliers to begin the transition to low-sulfur and ultra-low-sulfur diesel. By 2014, this process was nearly complete. Diesel fuel prior to 1993 had an average sulfur content of 3,000 ppm (high-sulfur diesel); the limit for ultra-low-sulfur diesel is 99.5% lower. Sulfur is removed from distillate fuel during the refining process by reaction with hydrogen. This process, known as catalytic hydrotreating, strips away sulfur as well as nitrogen, oxygen, and metals from hydrocarbon compounds. These reactions reduce the weight per gallon and a small portion of the thermal energy obtained from the combustion of a gallon of distillate fuel. EIA's calculation of the heat content of distillate fuel supply in the United States reflects these changes, going from about 138.6 thousand British thermal units (Btu) per gallon in 1994, to an estimated 137.5 thousand Btu per gallon in 2014. Heat content is a necessary component when comparing consumption across various physical units of energy, such as gallons of gasoline or cubic feet of natural gas. 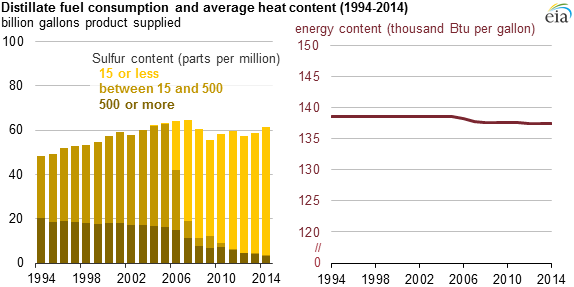 Appendices to EIA's Monthly Energy Review provide heat content factors for several fuels.